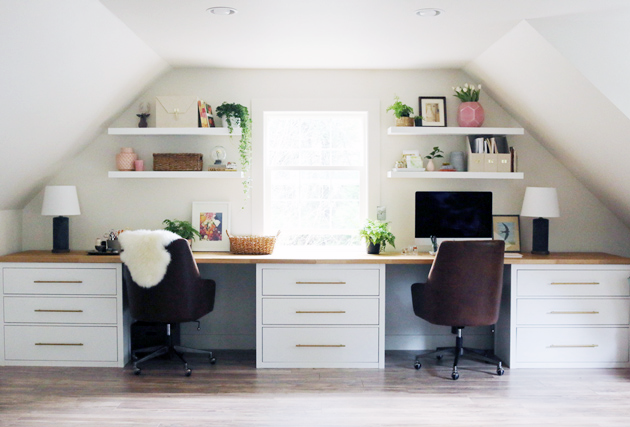 The unfinished storage space turned studio was an exciting transformation. Once the shell was complete, I got to work coming up with a classic/modern design plan. We moved into our house in October 2016 and even though we weren’t planning on doing a kitchen makeover for a few years, we decided to make a mini one happen before we hosted our family for Christmas. We were literally installing the open shelves on Christmas Eve and are so proud of what we did (for under $1000!) to update the existing kitchen. Here’s the post with all the details. Perhaps the best purchase we’ve ever made is this big, cushy couch. It sits in our family room, where we spend the majority of our time and our whole family (plus more) fits comfortably. After a year of living, sitting, laying, snuggling on the couch, we remain very happy with our choice. Here’s a link to the post with details, and this is the couch we chose (in Taft Cement). While progress was still being made in the studio (like my semi-diy lamp solution), we were also working on finishing out the third floor. 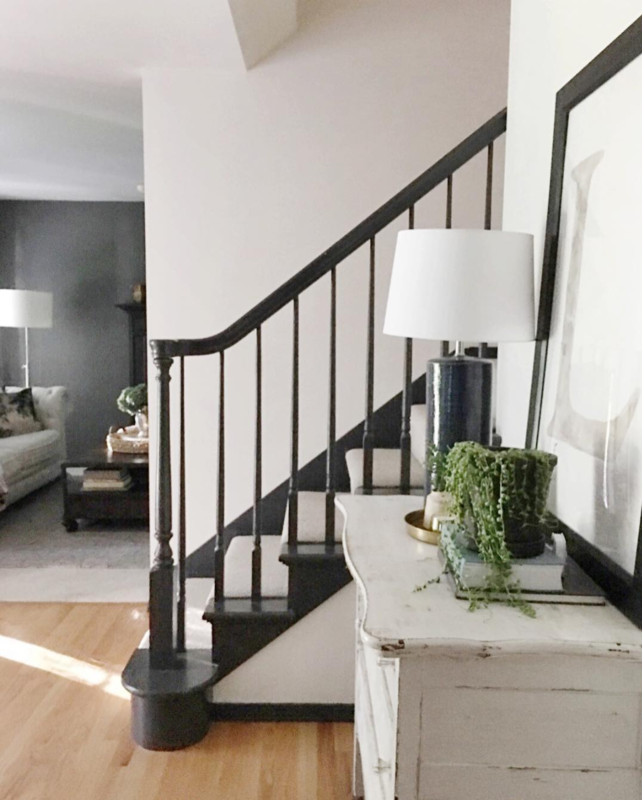 We continued painting out more trim in the entry in our go-to charcoal color (Iron Ore by Sherwin Williams). Also of note: our baby turned 13.
and diy-ing my way to brass pulls. 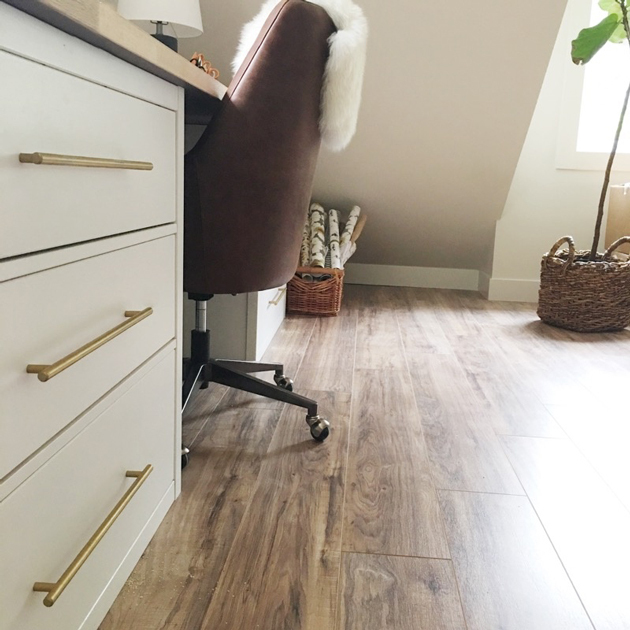 I shared all the details about how I used IKEA dressers and butcher-block countertops to create a custom desk. Once the studio was complete, I prettied it up with pink for a Spring tour. 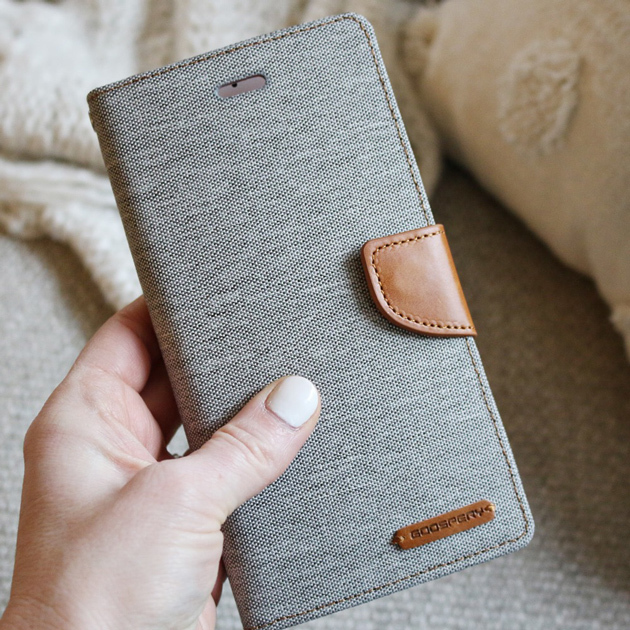 I’m a big fan of a wallet phone case and shared all my reasons why I love it so. Spring hits and there’s suddenly the urge to organize everything. The drawers in studio were first on my list. Upstairs got a light, bright and fresh makeover in April with new carpet, trim and paint. 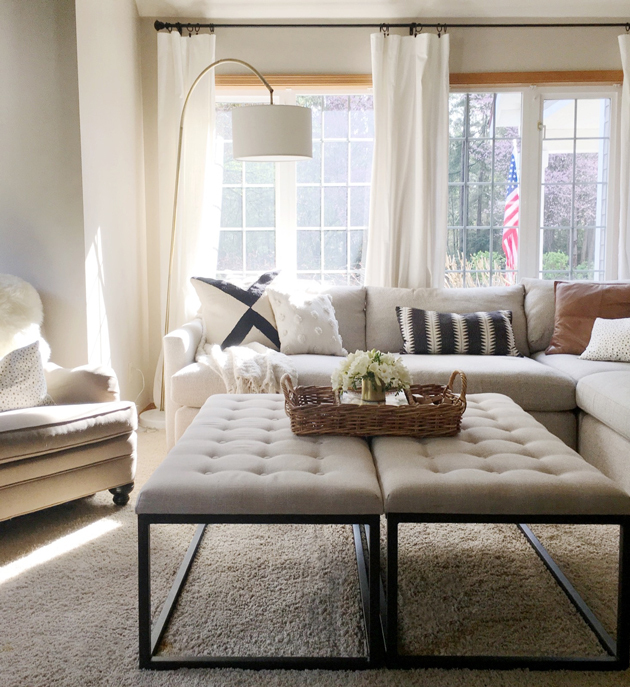 We updated all the lights in the house and compiled a list of favorite flush mounts. The third floor hangout space for the kids was finished! Our family road trip made it into the Magnolia Journal. 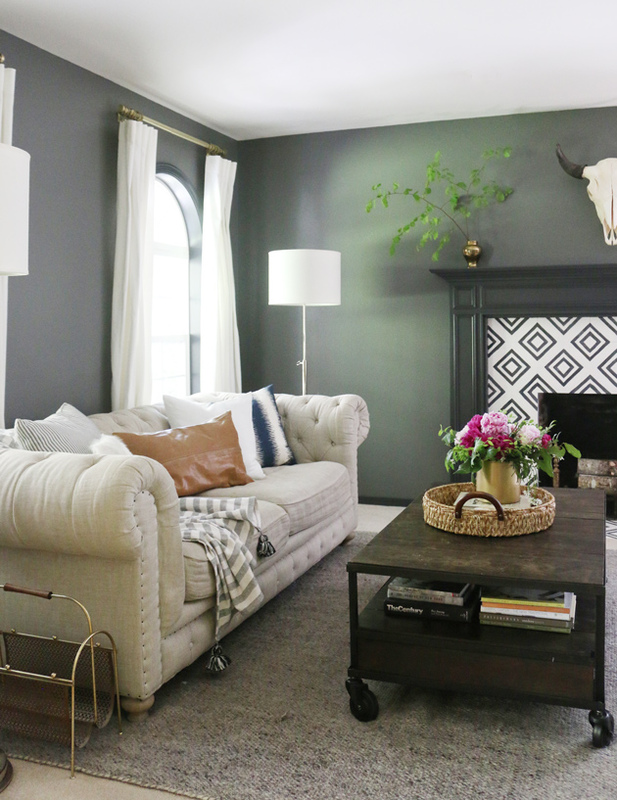 We finished phase one of the living room remodel (with diy cement tile that I adore). Our collection of illustrated children’s books continues to grow – our 48 favorites are listed here. A few new additions made their way into the studio just in time for a summer tour. My brother and sister-in-law have an adorable lake house they are renovating and let me share their farmhouse kitchen. 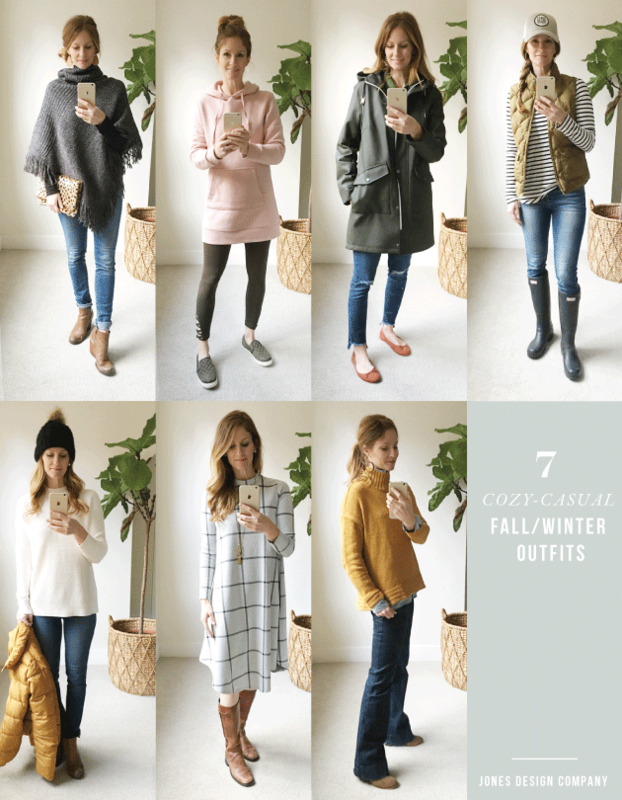 My seasonal fashion post was a hit with these seven summer outfits. There’s nothing like summer clothes that motivate you to get yourself in shape … all about my go-to workout. 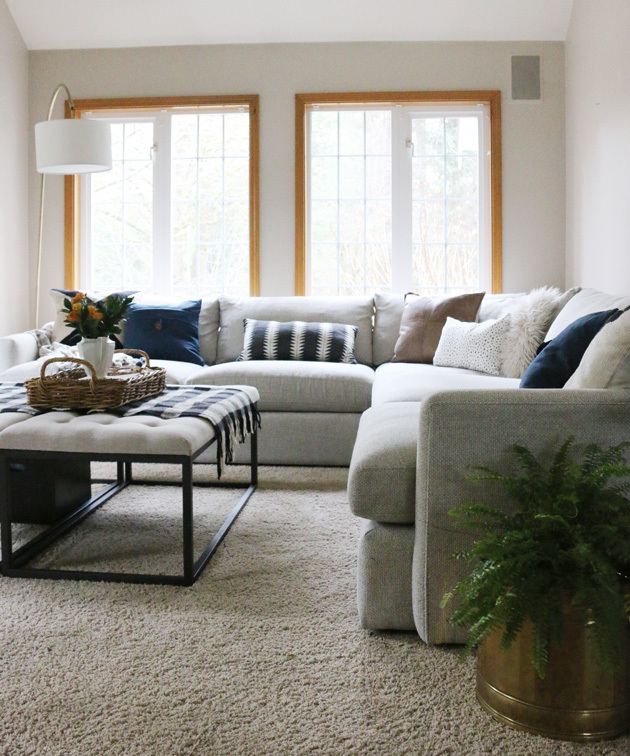 We have big plans for this room, but a phase one family room makeover was in order just to give it a little more style. We got chickens this spring. I shared all about their coop, their laying and how we’re liking this country life so far. I made over our guest bathroom with removable wallpaper and paint. What a transformation! I forget how much I love reading until I find a great book … and then I get on a roll. My summer reading list was a good one. We sold our bed frame in the spring and are using step stools as nightstands, but I still try to make my bed each day. It just keeps me feeling like I have things *sort of* under control. The end of summer calls for fall decorations to come out and it was fun to share a quick fall studio tour. This year, I have fallen in love with a handful of podcasts. Here are my favorites. I turned 39 at the beginning of October and decided to write a list of 40 things to do before I’m 40. We celebrated one year of living in our new house! We’ve worked hard to update the house … here’s a recap of what we did to the house in our first year. Fall outfits are my fave. A simple DIY pillow inspired by the new Magnolia Hearth + Hand collection. Getting ready for Christmas with a christmas studio tour and jingle bell garland tutorial. A wreath display in the family room. The entry and living rooms decked for Christmas. The enneagram changed my life, I became an earring wearer, The Crown captured my attention, I took time to slow down, we survived all four kids playing a sport at the same time, we unpacked our last moving box (just a few weeks ago! ), failed a few times at making a sourdough starter but finally baked my first loaf of bread, and successfully kept the front porch ferns alive. It’s been quite a year. So many great things; a handful of hard ones. The world is in a weird spot and I can only grow deeper in my faith that our hope does not come from pretty houses or secure jobs or sunny weather, but in the never-failing love, grace and faithfulness of Jesus. What a great intro to your blog! Your name got thrown out at a MOPS meeting this week– I hope you’re able to come this year! And I’m so glad. I’ve really appreciated some links about blog setting, life and home. Welcome to Gig Harbor! We put a heat lamp out there when it was freezing + snowing a week or so ago. Our normal low temps in the winter are fine for them (as far as we know)! Where did you get the white stag head that you have in the upstairs kids hangout space? It is paper mache – I think from Target? My mother in law gave it to us. She painted it with leftover wall paint. Love the last line! Happy New Year! Just stunning accomplishments and a lovely recap. Such a nice recap….I pray to always focus on the last line through 2018 and always. Best wishes to you and your beautiful family in the New Year! Wishing you and your family a very Happy New Year filled with blessings and continued inspiration to share the joys that add meaning to life. 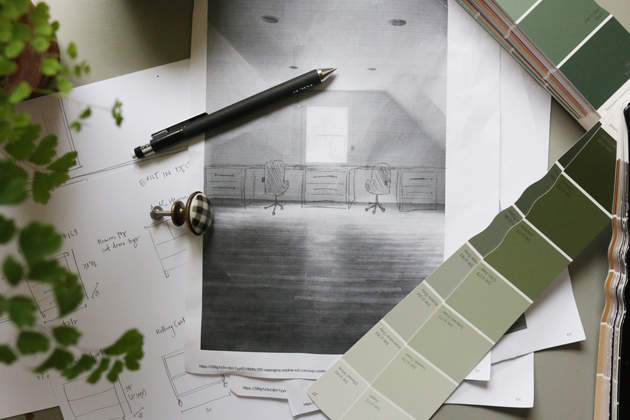 Your home is beautiful, and has been a great influence on my own decorating style! I love this post, but especially the last line. Have a super 2018! Happy New Year to you and your family! Thank you for all the great inspiration! Wonderful recap here. I would love to know where you got the brown leather chairs from your office? I wasn’t able to find it on your site. Thanks! HNY. What a fun look back over the year! I was inspired by you taking the enneagram and found out that I’m a 9 too. Looking forward to digging into some of the books you’ve read about it. Love this post (and your blog), but your last paragraph was the best, and totally my take on things, as well. Keep up the good work.